Look closely at any of the pointillist George Seurat’s paintings and you’ll see a lot of dots (or dabs to be precise) and you’ll also see the many blues and purples he used to liven up the dark shadows (Example on right: Le Chahut – c. 1889). You’ll see a similar finish when you look closely at a photograph shot at 12800 ISO and overexposed in the blacks; The camera’s sensor is amplifying what little light it gets to see* and the interestingly coloured noise is the result. (* It gets to see little light as that is the settings I chose when selecting 1/200th of a second). Digital noise is generally seen as a failing of the camera but it suits my purposes well here. Light itself is blobby and doesn’t arrive in a uniform stream apparently, so it’s not only the camera’s fault. Perhaps the Impressionists could actually see these colours for real in the dark areas too! 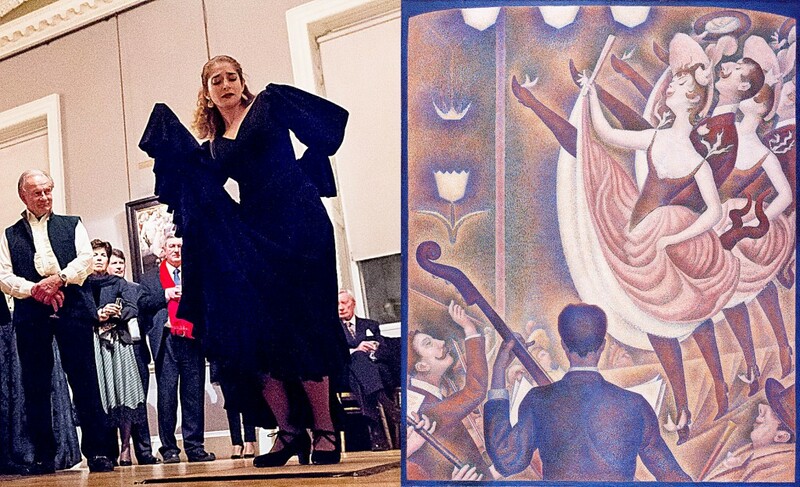 My picture here on the left was taken at the Goya Directors’ Dinner held by The Courtauld Gallery; a late 1700s Spanish themed evening complete with flamenco dancer. The Courtauld Gallery, like many institutions that house incredibly valuable artworks has a no flash photography policy. Does the flash damage the work? UV light flash tests have been done on some pigments and you can read Martin H. Evan’s detailed essay to find out more. The results may well be incomplete and the inferences on the data seem to be from the point of view of a photographer instead of a conservationist’s long view, however, the proposal of closing the gallery a few minutes early and turning off the ambient lights to offset the day’s camera flashes puts the problem into perspective. At the Goya event I photographed, there were only forty-five people enjoying a visual, audio and culinary Goyaesque treat and my view is that any flash would have been an intrusion; the same type of intrusion as a phone ringing during the classical music recital, or perhaps someone squirting vinegar into the ice-cream you were eating (Have I gone too far?) What about being mildly stabbed while enjoying a back massage? OK, You get the point. Previous: Previous post: March 2015. My new baby boy arrived!